A variety of American players, including Eric Butorac, Bethanie Mattek-Sands, Jill Craybas and rising stars Lauren Davis and Varvara Lepchenko, are blogging for USTA.com during the 2011 Australian Open in Melbourne. Check back to see who is blogging next! My partner Jean-Julien Rojer and I won our doubles match today at the Australian Open over David Marrero and Rueben Ramirez-Hidalgo, 6-3, 6-4, and have reached the quarterfinals, where we will play the fourth seeds Lukasz Kubot and Oliver Marach. We're not seeded, but we came into the Australian Open ranked around No. 17 so just missed out on being seeded and thought we had a pretty good chance to go far. We've played a few of those Spanish teams before, and they play a different style of doubles. They are serving and staying back, playing two back on the returns, and that's becoming a more common style. We worked on our style of play during the off-season as to how to approach playing those types of teams because we play a more conventional style. Today, we played the match on our terms. We played a lot of returns at the net man instead of playing to the guy who is serving and staying back, a lot of hit and get in quickly, and reflexes at the net off when those guys rip shots at you. Our goal was to turn it into a doubles match and not let them get into rhythm. We'd hit deep and get in, hit shorter to bring them in, and lob and get in. We made a lot of first serves and returns. I made 86 percent of my returns, and a lot of them were different types, and that's a high percentage. We don't want to sit back and try to rally with them because that's to their advantage. Up until right after Wimbledon, I was playing with another American, Rajeev Ram, and we did pretty well together, but he wanted to focus more on his singles ranking and had to go play some Challengers. As a doubles player, I can't afford to go down to that level. Jean-Julien and I had a great fall together. We won Tokyo and Stockholm. Jean-Julien went to and played for UCLA, and I've known him for a while. I've played against him, I've practiced with him, and I knew our styles would match up really well. He's a very good server who doesn't blow you away with pace but has great location. I'm very good at the net as the server's partner and can help turn a good serve into a great one. Plus, we both make a lot of returns. Those are the two most important things in doubles these days. It's great to be good volleyers and hitters from the baseline, but, when it comes down to it in the men's game, 70 percent of points are won on serve and return. Plus, we put tons of balls in play. I'm a lefty, and he's a righty. I return from the deuce court and have done that most of my career and like it there. I guard against the wide serve, if I get stretched out, by going down the line or using a lob. I cheat to guard against the slice serve out wide because a lot of guys can hit that serve. I concede the down-the-T serve, unless I've scouted the guy and know he can hit it, and then I respect it. But a lot of guys don't like that serve and have trouble going with the flat one inside-out up the T, so I take away their wide one and say if you are going to hit that one down the T, it has to be an ace. If you miss, you are going to give me a second serve, and I'm going to put it on your shoes. Rojer and I are planning to stay together all year, but that's always the plan. Doubles teams change a lot because the grass is always greener on the other side. You see other guys out there and you think you might play better with them, but right now I couldn't be happier. People ask me who would be my ideal partner, and I've got the guy I want. He works harder than anyone I know, he fights harder, competes better and is getting better every day. Plus, he's a fun guy to go to battle with. It's important that you get along with your partner off court because you are going to have to spend a lot of time with him. Some of the older guys don't hang out as much. I've been really impressed with India's Mahesh Bhupathi and Leander Paes' comeback as a team. Their chemistry looks great. I know they had a little scuffle with Lopez and Monaco, and they were in Paes' face and telling Mahesh, "I don't have a problem with you," and Mahesh was saying, "If you have a problem with my partner, you have a problem with me." They were really together. As a fan, it's awesome to see those guys together again because they were like rock stars when they were together before, so I hope it works out and they keep it rolling. It's great for our sport when we have popular teams like that. We feel like we have a shot to win the whole tournament. Rajeev and I reached the quarterfinals last year and lost to the Bryans 7-6 in the third. 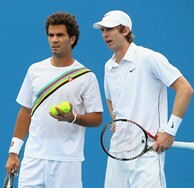 The Bryans are probably better than we are, but it's one match, and we are playing as well as we ever have, so who knows?